In the late 1960s, Sikorsky Aircraft had many helicopter models in production, but they had lost contracts to develop new helicopters. In 1966, the United States Army’s Advanced Aerial Fire Support System (AAFSS) contract was awarded to Lockheed, but their AH-56 Cheyenne attack helicopter ran into serious design issues. On 20 November 1969, Sikorsky initiated development of a new helicopter to be used primarily as a gunship, but it could also be used in other roles. This helicopter was designated S-67 Blackhawk, and its design and construction was self-funded by Sikorsky. 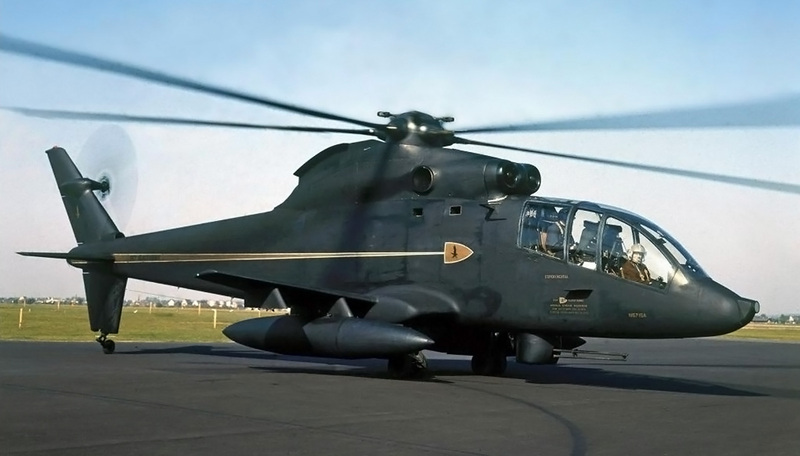 The Sikorsky S-67 Blackhawk was a very versatile helicopter that exhibited great performance, but it also had various shortcomings that the US Army could not overlook. The helicopter’s narrow fuselage and air brakes are illustrated in this image. The Sikorsky S-67 Blackhawk was designed as a high-speed attack helicopter with a small wing to generate lift. The pilot and copilot/gunner sat in tandem in the helicopter’s cockpit, with the copilot in the front seat and the pilot in the rear seat. The pilot accessed the cockpit from the left side of the helicopter and the copilot from the right. The narrow, streamlined fuselage was only 3 ft 10 in (1.2 m) wide, which decreased the helicopter’s drag and increased its survivability by presenting a smaller target to enemy gunners. Behind the cockpit was a compartment that could be used for additional equipment or to transport personnel. This image shows the S-67’s original tail that did not have any rudders. Note the tail’s camber. Air brakes can be seen on the upper wing surfaces. The main gear had a 7 ft (2.1 m) track. To cut expense and development time, the S-67 was designed to use the dynamic drive power system from a Sikorsky S-61/SH-3 Sea King. This included two 1,500 hp (1,119 kW) General Electric T58-GE-5 turboshaft engines and their drive, rotor, hydraulic, and electrical systems. The S-67’s five-blade rotors had 22 in (559 mm) of their tips swept back 20 degrees to delay compressibility effects, lower vibration, and reduce noise. The net effect was that the blades allowed the helicopter to achieve higher speeds. The main rotors also had a hub fairing, and their collective pitch control was modified to increase sensitivity and range. The S-67’s main gear retracted into sponsons mounted on the fuselage sides. The helicopter’s thin wings extended from the sponsons. Each wing featured two hardpoints for weapons, auxiliary fuel tanks, or equipment. Each wing also had three air brakes: two that deployed along its upper surface and one that deployed along the lower surface. With the air brakes deployed, the helicopter slowed twice as fast as without the air brakes. In addition, the air brakes could be deployed during combat to offer unrivaled maneuverability. The S-67 was the first helicopter with air brakes. 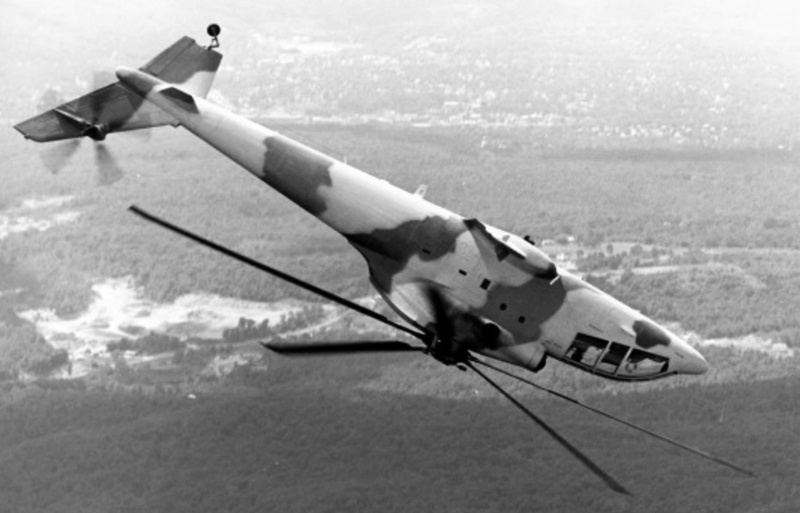 A five-blade, 10 ft 7 in (3.2 m) diameter tail rotor was mounted to the left side of the S-67’s vertical fin. A lower fin with a non-retractable tailwheel extended below the helicopter’s tail. The large upper and lower fins were cambered to counteract the torque of the main rotor at speeds above 46 mph (74 km/h). This enabled controlled flight without the tail rotor as long as the S-67’s forward speed was in excess of 46 mph (74 km/h). If the tail rotor was lost, the helicopter could be flown back to base and landed like a conventional aircraft. The S-67 used an all-moving horizontal stabilizer that increased the helicopter’s maneuverability and decreased rotor stress. Note the angle of the all-moving horizontal stabilizer as the S-67 comes in for a landing. The landing gear was found to be insufficient for operating from unimproved locations. The helicopter’s double main wheels sunk into soft ground, and the gear doors only had 9.75 in (248 mm) of clearance. With a 7,000 lb (3,175 kg) payload, the S-67 could accommodate a variety of armaments. A removable Emerson Electric Company TAT-140 turret mounted under the cockpit could carry a 7.62 mm minigun (M134), a 20 mm three-barrel rotary cannon (M197), a 30 mm single-barrel cannon (XM140), a 30 mm three-barrel rotary cannon (XM188), or a 40 mm grenade launcher (M129). The four underwing hardpoints could carry two drop tanks, up to 16 TOW missiles, or up to eight rocket pods. Each 2.75 in (70 mm) rocket pod contained 19 rockets, for a total of 152 rockets. The S-67’s rudders can be seen in this image. One is on the upper fin below the tail rotor, and the other is on the lower fin. Pylons have been installed on the wings’ hardpoints, with drop tanks mounted to the inner stations. The turret is installed with a M197 three-barrel 20 mm cannon. The S-67 had a wingspan of 27 ft 4 in (8.3 m) and a rotor diameter of 62 ft (18.9 m). The fuselage was 64 ft 2 in (19.6 m) long, and the helicopter’s total length including the rotor was 74 ft 1 in (22.6 m). The S-67’s mast height was 15 ft (4.6 m), and the top of the tail rotor was 16 ft 4 in (5.0 m). The helicopter’s top speed was 213 mph (343 km/h); maximum cruise speed was 201 mph (324 km/h), and normal cruise speed was 167 mph (269 km/h). The S-67 could climb at 2,000 fpm (10.2 m/s) and had a service ceiling of 20,000 ft (6,096 m). The helicopter could hover in ground effect up to 9,700 ft (2,957 m) and could hover without ground effect up to 6,500 ft (1,981 m). Maximum range on internal fuel was 325 miles (523 km), but its normal combat range was 220 miles (354 km). With external fuel tanks, range was extended to over 600 miles (966 km). The S-67 had an empty weight of 12,525 lb (5,681 kg), a normal weight of 18,500 lb (8,391 kg), and a maximum takeoff weight of 22,050 lb (10,002 kg). The S-67 seen in the same configuration as the previous image. 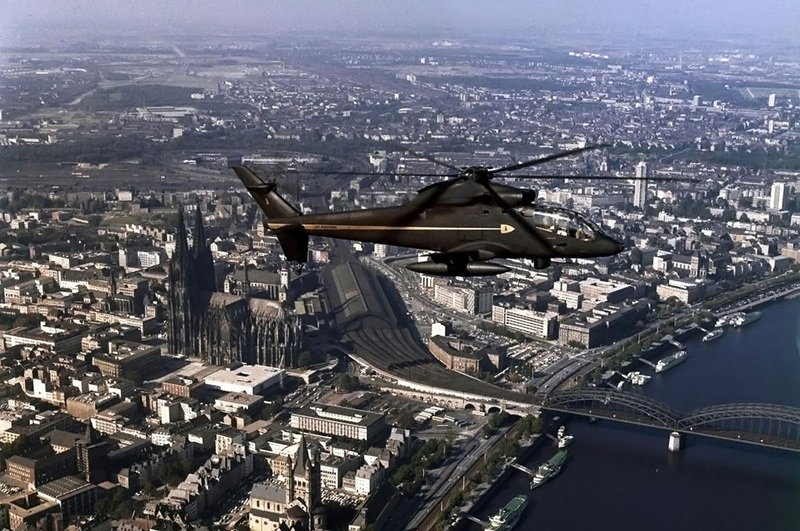 The helicopter is over Cologne, Germany on its European and Middle Eastern tour in 1972. Construction on the S-67 started on 15 February 1970 and proceeded rapidly. The helicopter made its first flight on 20 August 1970. Flight testing proved the S-67 to be very responsive, maneuverable, smooth, and quiet. The helicopter was able to perform rolls, loops, and split-S turns—although, only rolls to the right were made. On 14 December 1970, Sikorsky test pilots Kurt Cannon and Byron Graham in the S-67 established a new absolute speed record by averaging 216.841 mph (348.971 km/h) over a 3 km (1.86 mile) course. They then set a new record on 19 December 1970 by averaging 220.888 mph (355.485 km/h) on a 15–25 km (9.3–15.5 mile) course. In 1971, the S-67 covered 3,500 miles (5,633 km) touring 12 US military bases. In addition to Sikorsky demonstration flights, the helicopter was flown on 147 demo flights with military personnel. The S-67 completed 155 rolls and 140 split-S turns during these flights. A fan-in-fin anti-torque system was tested in the S-67. Note the rudders above and below the fan. No issues were encountered with the fan-in-fin, but the helicopter was converted back to a conventional tail rotor. Between 25 May and 13 June 1972, the S-67 was flown 26 hours for a series of flight evaluations by the US Army. The helicopter was competing against the Bell 309/AH-1 KingCobra to replace the AH-56 Cheyenne, which had been cancelled. For the AAFSS role, the S-67 was designated AH-3, and Sikorsky’s proposal included adding an additional hardpoint to each wing, bringing the total number to six. This would enable the S-67 to carry up to 24 TOW missiles. While the S-67 was praised for its performance and most of its flight characteristics, the evaluation recorded a number of shortcomings. 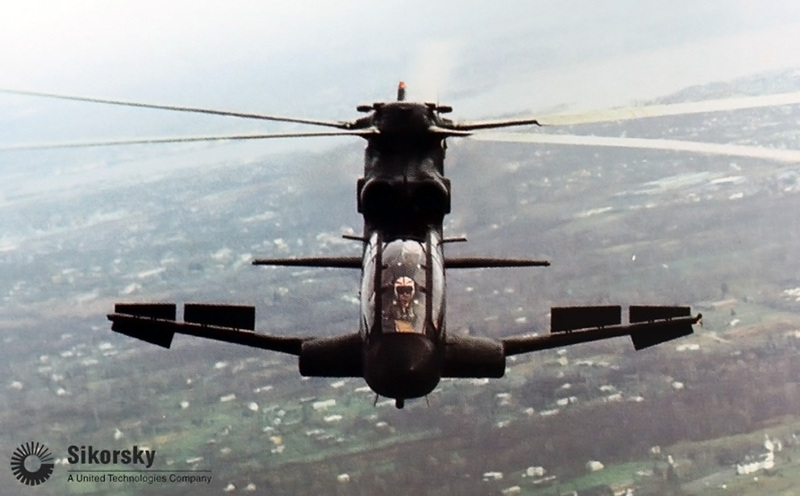 The Army did not award either Sikorsky or Bell a contract and decided to initiate a new Armed Attack Helicopter program, which eventually was won by the Hughes AH-64 Apache. The S-67 underwent a number of modifications in late 1972. Rudders were added to the ventral and dorsal fins to increase yaw control. The compartment behind the cockpit was altered to enable the transport of six troops. Hardpoints were added to the wingtips for each to carry a Sidewinder missile. A hoist was added under the helicopter that allowed the S-67 to transport a 7,000 lb (3,175 kg) external load. After the fan-in-tail rotor tests, a small door was added on the left side of the fuselage to access the compartment behind the cockpit. Initially, access was gained (with some difficulty) via the door under the fuselage (seen above). 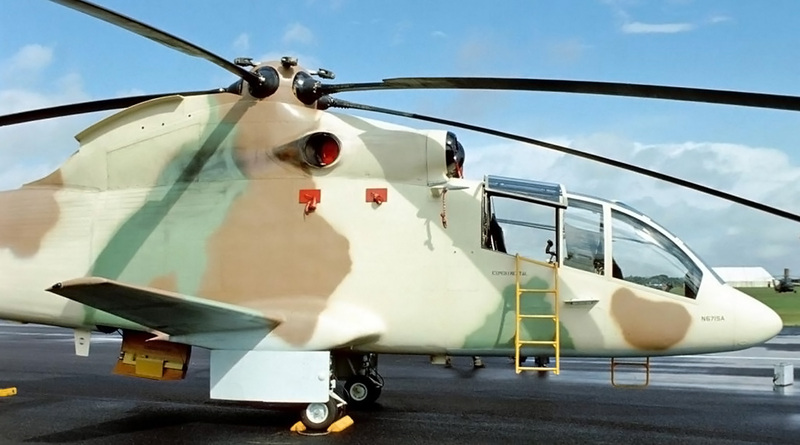 The S-67 was then painted a light desert camouflage, and this was the helicopter’s final configuration. 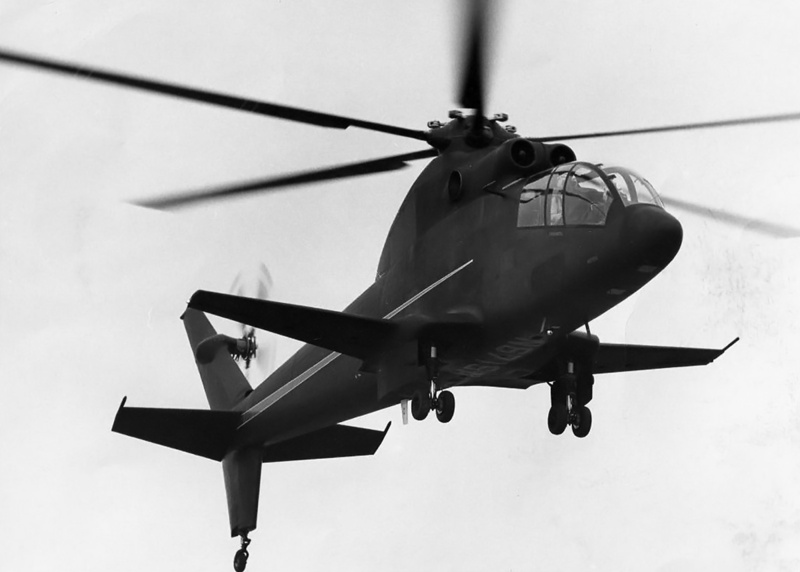 With no interest from the US Armed Forces, Sikorsky offered the S-67 for export. In late 1972, the S-67 was taken on a two-month tour of Europe and the Middle East. More than 7,500 miles (12,070 km) were covered, and the helicopter was flown for 136 hours. Despite interest from Israel, no orders were placed. 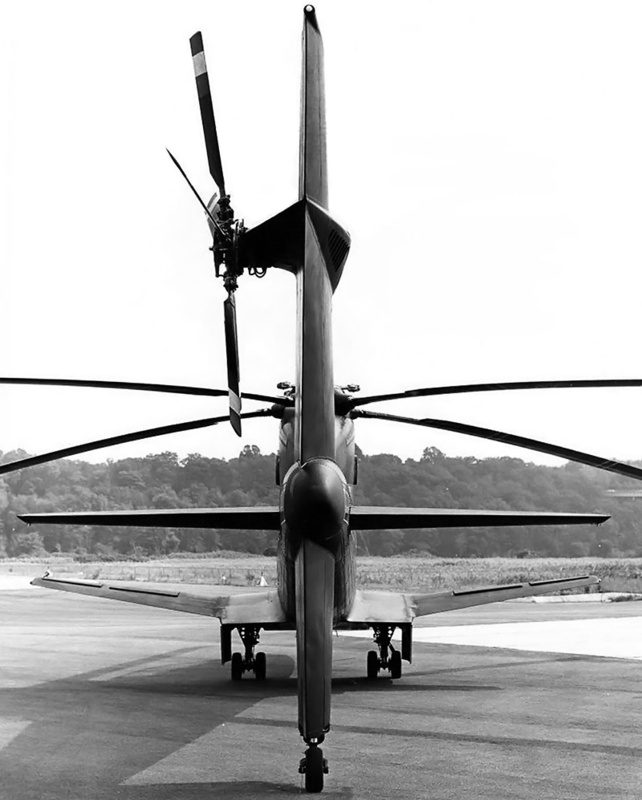 Sikorsky then modified the S-67 to test a fan-in-fin tail rotor installation. A 4 ft 8 in (2.6 m), seven-blade rotor was installed in the modified tail. The helicopter underwent flight tests, including a dive at 230 mph (370 km/h). 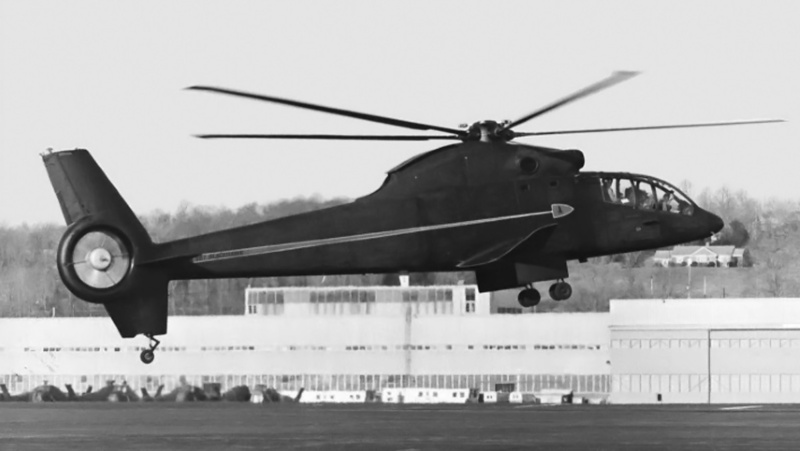 After the tests in 1974, the S-67’s tail was converted back to its previous configuration (with rudders), and a door to access the rear compartment was installed in the helicopter’s left side. The S-67 was then painted a light desert camouflage. The data from the fan-in-fin test was used for the Sikorsky H-76 fantail demonstrator, which tested the tail configuration later used in the Boeing-Sikorsky RAH-66 Comanche. The S-67 made hundreds of rolls in its lifetime, but they were always to the right. The square in the fuselage above the wing is the window in the new rear compartment access door. What appear to be two rectangular windows can be seen father aft. Note the helicopter’s rudders and deployed air brakes. On 26 August 1974, the S-67 arrived in the United Kingdom to start another European tour. On 1 September 1974, the S-67 was destroyed after failing to recover from a second roll during a practice session for the upcoming Farnborough Air Show. The copilot, Stu Craig, was killed in the crash, and the pilot, Kurt Cannon, died from his injuries nine days later. The accident was caused by the second roll being initiated in a less than ideal configuration combined with low altitude. However, the accident investigators believed that the crash was survivable had the helicopter been fitted with five-point harnesses rather than four-point harnesses. The S-67 had accumulated 598.7 hours at the time of the crash. With the prototype destroyed and no interest from the US military, Sikorsky decided to end the S-67 Blackhawk program. Its swept-tip rotor blades were developed into those used on the Sikorsky S-70/UH-60 Black Hawk (the name similarity is a coincidence) and other helicopters. The S-67’s speed record stood for eight years until it was broken on 21 September 1978 by the Soviet Mil A-10 (modified Mi-24B) at 228.9 mph (368.4 km/h). The S-67 tries to recover from a roll a split second before it impacts the ground. The helicopter’s low altitude left no room to recover from the roll, which was rushed and initiated in a flawed manner. The crash would ultimately kill the pilot and copilot and end the S-67 program. This entry was posted in Post World War II, Rotorcraft on 20 August 2017 by William Pearce. Why did the S-67 roll only to the right, and not to the left? Simply enough, the roll maneuver was conducted only to the right to eliminate the problem of interference between the collective stick, the pilot’s leg, and the cyclic stick. Bill: Thank you for such a great overview of the S-67. I have spent my life seeking information, write ups, comments, images and videos of this fantastic machine. My father loved flying her and died doing what he loved. I believe your post is the greatest compliment I could ever receive on this article. Never would I have thought that the son of one of the test pilots would stumble upon my humble little site, but I’m glad you did. Just know that people still care.